A few weeks ago, Linda Smith came to our church and spoke about her journey from working in the US Congress to founding Shared Hope International--an organization that works to end human trafficking both stateside and overseas and that also works to help rescue trafficking victims and rehabilitate them. (Such sterile words for such vital work!) After service, I had the privilege of taking her out to lunch to talk about her work, and I walked away with a copy of this book. This is a fast read--only 100 pages--but it tells compelling and tragic stories intermixed with brutal facts about the state of human trafficking around the globe. I read the book through a veil of tears, and this wasn't even my first exposure to the reality of trafficking. (In 2008, I worked with Bombay Teen Challenge [a partner with Shared Hope] and heard these kinds of stories firsthand from survivors.) It is hard to hear what brutalities people commit against others, but it is so important to be aware. These sorts of tragedies happen all around the world--not just in Mumbai, Amsterdam, or Las Vegas. If you don't know much about human trafficking, I highly recommend this book. It won't take much of your time, but it will change the way you see the world and will give you ways to help stop modern day slavery. 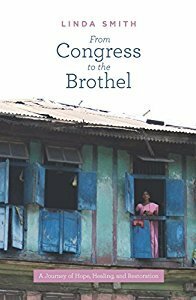 Sign into Goodreads to see if any of your friends have read From Congress To The Brothel.